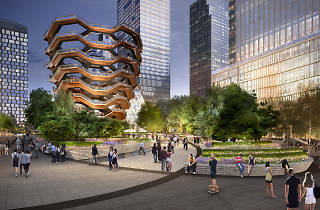 Vessel, as it’s called, is the handiwork of designer de jour Thomas Heatherwick, a Brit known for envelope-pushing proposals such as a bridge across the Thames that is also a tree-filled park. Stairs do indeed factor into the installation—some 154 interconnecting flights of them, in fact, comprising 2,500 individual steps and 80 landings that add up to a mile of pathways rising from a 50-foot diameter base before widening at the top to 150 feet. Clad in glass and cooper, Vessel is 15 stories high and weighs 600 tons. 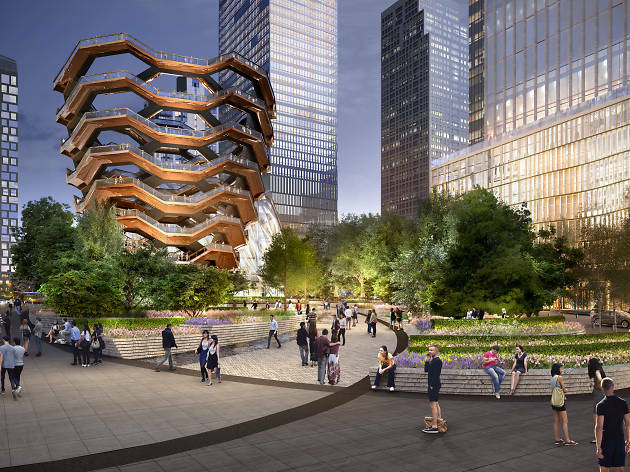 It will definitely be hard to miss, and will undoubtedly entice tourists from off of the High Line and elsewhere. A word of advice if you plan to visit Vessel some day: Make sure you’re in shape; 150 flights is a long climb.